When the traps are reeled in, the GoPro camera attachments are unclipped and brought into the dry lab. The cameras are encased in waterproof housing that can withstand the higher pressure at the seafloor. One camera is placed on the front of the trap, and one camera is placed on the back. Each video card captures ~45 minutes of footage. The videos will be carefully scrutinized at a later date to identify the fish (since many do not enter the traps), describe the habitat, and also describe the fish behavior. While aboard the ship, the videos are downloaded and watched just to make sure that the cameras worked properly, and to gain a general idea of what was happening around the trap. 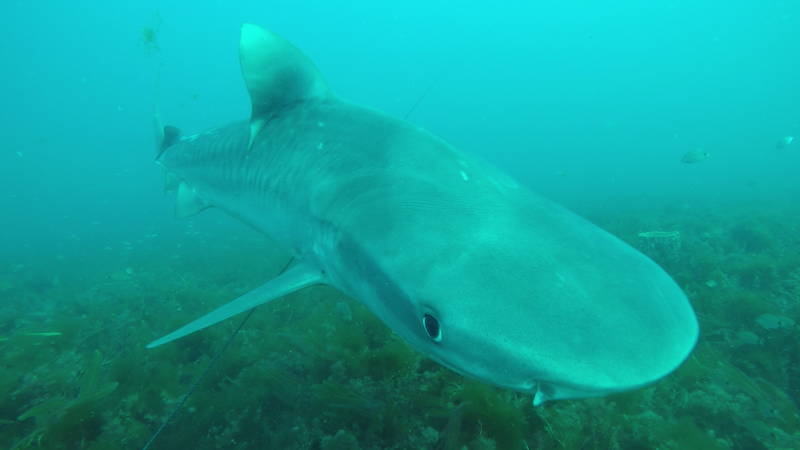 Occasionally, there are some really exciting moments, like when a tiger shark decided to investigate our trap! This tiger shark appeared in the video from both trap cameras as it circled. Once the fish are identified, they are sorted into different bins. We record the mass of each bin and the lengths of each fish. Most of the smaller fish are returned to the ocean once the measurements are recorded. Some fish are kept for further measuring and sampling. For each of these fish, we find the mass, recheck the total length (snout to tail), and also measure the fork length (snout to fork in tail) and standard length (snout to start of tail). 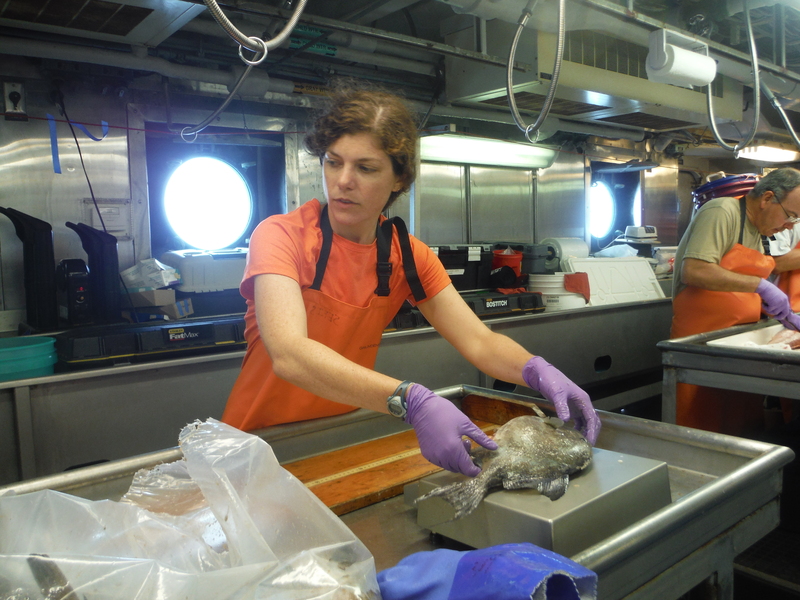 I measured the fish while one of my crew mates recorded the data. Otoliths (ear stones) are made of calcium carbonate, and are located near the brain. As the fish grows, the calcium carbonate accumulates in layers. As a result, otoliths can be used – similarly to tree rings – to determine the age of the fish. I retrieved my first set of otoliths today! Muscle tissue (the part of the fish that we eat) can be used to test for the presence of mercury. Since mercury is toxic, it is important to determine its concentration in fish species that are regularly consumed. Gonads (ovaries in females or testes in males) can be examined to determine if a fish is of reproductive age, and whether it is just about to spawn (release eggs / sperm into the water). The stomach contents indicate what the fish has eaten. 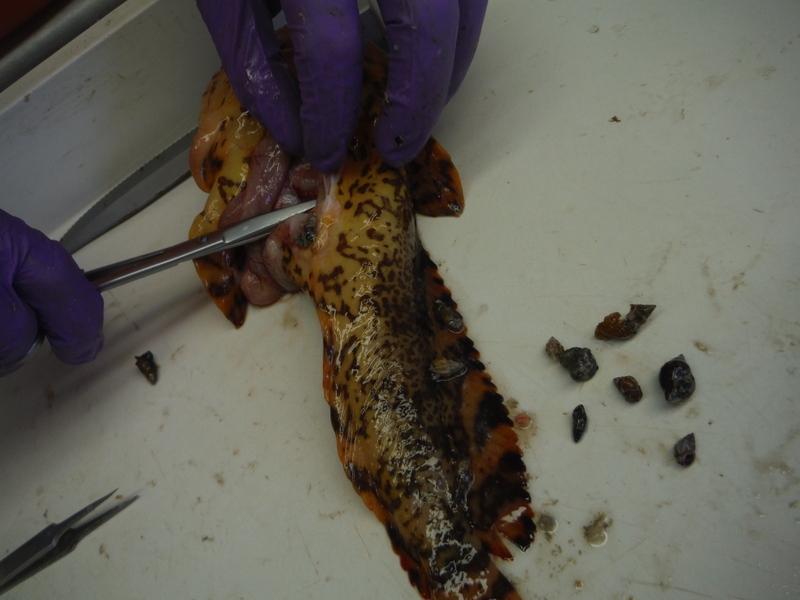 This toadfish had snail shells in its stomach! The soft tissues are kept in bags and preserved in a freezer in the wet lab. Sample analyses will take place in various onshore labs. It is important to remember that this ship is home to most of the people on board. They live and work together in very close quarters. There are daily routines and specific duties that individuals fill to keep Pisces running smoothly. Cooperation is key. I do my best to be useful when I can, and step aside when I cannot. Despite my inexperience at sea, everyone has been incredibly kind, patient, and helpful. I am lucky to be surrounded by so many amazing people who are willing to show me the ropes! The lionfish is an invasive species in the Atlantic Ocean. Its numbers are increasing in waters off the Southeastern U.S. coast. These fish have few predators, and they are consuming smaller fish and invertebrates which also sustain local snapper and grouper populations. 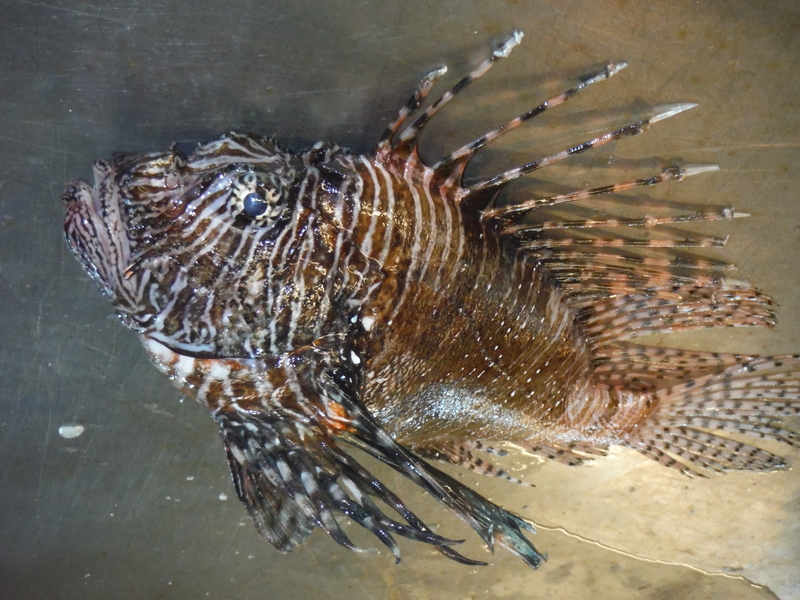 This lionfish was in one of our traps yesterday. This entry was posted in 2015, Leah Johnson, NOAA Fisheries Service, NOAA Teacher at Sea and tagged Atlantic Ocean, black sea bas, fisheries, lionfish, Pisces, red porgy, red snapper, scup, SEFIS, spottail pinfish, tiger shark, toadfish, tomtate, vermillion snapper, white grunt. Bookmark the permalink.